Having trouble with your boundary conditions or materials not aligning correctly with your mesh? When a simulation runs in SMS, it takes all of the components—such as boundary conditions and materials—and aligns them with the 2D mesh or other geometry. When creating boundary conditions in the Map module for SRH-2D, ADCIRC, or other models that use simulation components, it can sometimes be difficult to know exactly where the boundary conditions will line up with the 2D mesh nodes. To help with this, the boundary conditions map coverage contains a display option to see how the map arcs and mesh nodes will line up: the Snap Preview option. The Snap Preview option can also be turned on or off by using the Shift+Q shortcut key. When the Snap Preview option has been turned on, a dashed line will be displayed along the element edge to show where the boundary condition arcs will match up with the mesh nodes. This is helpful in identifying if the placement of the boundary condition arcs is correct. 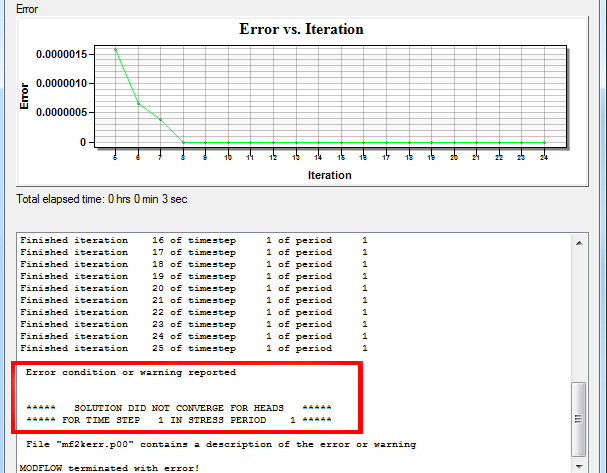 Incorrect placement of boundary condition arcs can cause errors in the model run. The Snap Preview option also works for other model coverages such as the SRH-2D materials coverage. This allows previewing how material assignments will match up with the mesh elements. Adjustments can then be made to the material polygons to correct any misalignments. Using the Snap Preview option can significantly reduce frustration and prevent errors early on. Try using Snap Preview in your SMS projects today! Parameter estimation using PEST can assist in data interpretation, model calibration, and predictive analysis. PEST can do a lot for your project. Because PEST offers so much, it can be a little overwhelming to use at first. We provide tutorials and articles on our wiki to help guide you in using PEST with GMS. In addition to the resources available in the tutorials and wiki, this post covers some useful tips that have helped some of our users. Verify that the parameter key values have been successfully initialized under MODFLOW | Parameters. The key values should match the parameters names. For example, if the key value for hydraulic conductivity is “-30”, the parameter name should be “HK_30”. No key value should be used twice, even across different packages. To continue the example, if you have an “HK_30”, there should not be a “RCH_30”. Key values are needed for both zones and pilot points. Key values are expected to be negative integers. Non-integers will not be automatically recognized as key values. If the key value is not a negative integer, or is a parameter from the WEL package, they will have to be manually added. If you’re missing a value, check that it initialized in the first place. Parameters included in the run will be written to the *.param file. Once PEST runs, the optimal values are written to the *.par file. If the iterations are giving identical values for the same parameter, check if the value is either the minimum or the maximum of the range assigned to the parameter, then evaluate if that range needs adjusting. Adjusting the starting values or the PEST options may help. Follow the recommended guidelines found here. You can get a quick 2D Scatter set to use for pilot points with the MODFLOW Layers → 2D Scatter Points tool. This is particularly useful for areal parameters, such as HK or RCH. If you’re running Null Space Monte Carlo, you must use pilot points and your interpolation method must be set to kriging. If running with SVD-Assist, you can point to the Jacobian file so it doesn’t re-solve for every iteration. Depending on the parameter, pilot points often should not start with zero values. This especially applies to log transforms. We hope these tips help and that your project are improved by using PEST with GMS. Do you have a project that requires modeling a dam, or similar structure, in HEC-HMS? WMS can make this process smoother with tools designed to help define the structure quickly and efficiently. 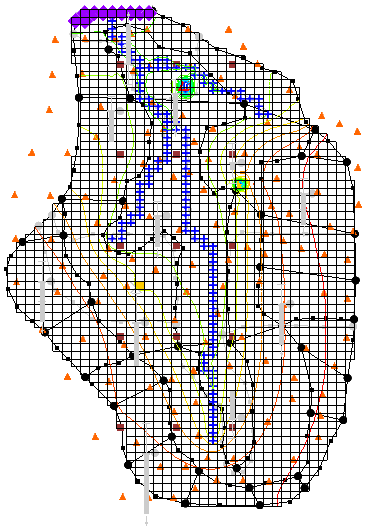 Begin with a delineated watershed with attributes defined. Determine where you would like to place your reservoir and place an outlet point there. Delineate your watershed and compute basin attributes using your new outlet point. Create a simulation in HEC-HMS and compare the runoff from the upper basin to the lower basin in order to size your reservoir. Convert the outlet node to a reservoir. 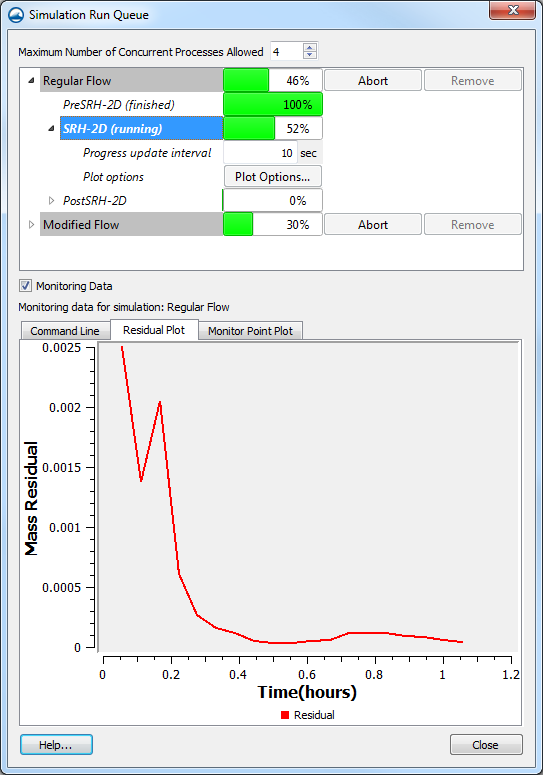 Switch to Hydrologic Modeling Module. Using Select outlet tool, select the outlet at the location where you want to model a reservoir. Right-click and select Add | Reservoir. Select Calculators | Detention Basins. Click Define to bring up Storage Capacity Input. For a dam: Use DEM and enter the height of the desired dam. Click OK to exit Storage Capacity Input dialog. The Detention Basin Analysis dialog will appear. Define the storage curve for your reservoir. Click Map to Hydrologic Model to open Map to Model. Name the series as desired. Double-click on the reservoir point to open the HMS Properties dialog. Here, you can choose the storage curve defined earlier, and define all other curves. To add an orifice to your dam, select Orifice Outlet from the Outlet Type drop-down. Define the orifice Center Elevation, Cross-sectional Area, and Discharge Coefficient. To add a spillway, select Broadcrested Spillway or Ogee Spillway from the Spillway Type drop-down. Define the required characteristics for the selected spillway. You can also choose to model an overflow type and dam break type if desired. With the dam, spillway and orifice defined, you can now run your model through HEC-HMS again to see how your reservoir will perform under the selected storm. Try out modeling dam structures and other applications in WMS today! A while back on this blog, we discussed troubleshooting MODFLOW errors. That blog post specifically discussed making use of the Model Checker, the MODFLOW command line output, and the output file. It also gave a few tips on how to fix your model when an error is encountered. We wanted to expand on this, and specifically discuss what to do when you model doesn’t converge. When the model does not converge, an error message should appear in the MODFLOW command line output. Essentially, when a model doesn’t converge component of the model has not been setup correctly. This inaccurate component may only cause the model to not converge when certain conditions have been met, but otherwise the model will converge when those conditions are not present. Check model inputs for reasonableness. Try running the model with different solvers. There are several solvers to choose from, and each of them have their own strengths and weaknesses. To switch solvers, select MODFLOW | Global Options | Packages and then select a different solver in the lower left area of the MODFLOW Packages dialog. Try changing the solver parameters. Check the troubleshooting items for a model that is not converging can be found under item K of the Frequently Asked Questions section of the Online Guide to MODFLOW. Deselecting the "Enable saving of computed flows for all source/sink objects" option in the MODFLOW Output Control dialog. Reduce the time step length for the model run. It can take some time to review the model to discover why it is not converging, but the effort it worth it for an accurate result. For more in-depth assistance with model troubleshooting, please consider reaching out to Aquaveo’s consulting team. Looking for a quick way to delineate a floodplain in your area? WMS provides a way to delineate a floodplain and create a flood impact map quickly, using many different types of data. 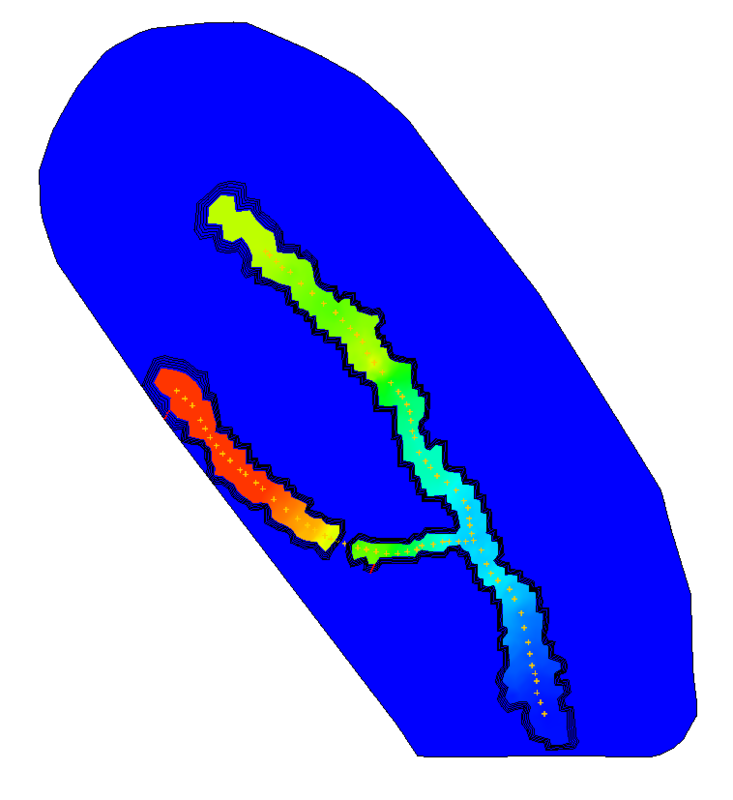 This blog post will cover how to delineate a floodplain using scatter point data. Use the Flood | Read Stage File menu command to import your scatter point dataset. This is the recommended method for importing a scatter point set for using in delineating a floodplain. With the scatter point set imported, now delineate the floodplain. Select Flood | Delineate menu command. 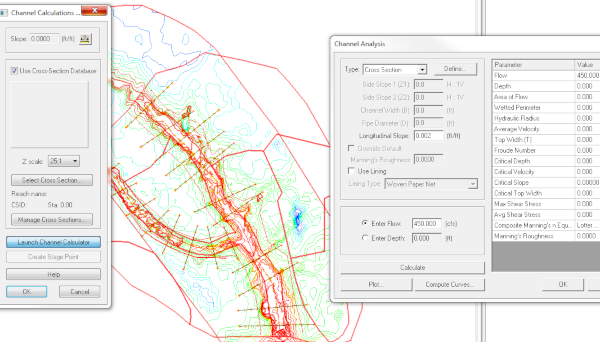 In the Floodplain Delineation dialog, choose the scatter point set you would like to model from the Select stage scatter point set drop-down menu. Select the specific dataset you would like to delineate from the Select stage data set drop-down menu. Set options for the Search radius, Flow path, and/or Quadrants depending on your individual model. When done with the Floodplain Delineation dialog, the delineation process will begin for the set of water surface elevations selected. In order to create a flood impact map, it will be necessary to have at least two different delineations using varying datasets. If you wish to go on to create a flood impact map, repeat steps 1-5 with a different dataset to obtain a new floodplain delineation. WMS can use two separate floodplain delineations to generate a flood impact coverage. A flood impact coverage shows the difference between two flood depth or water level sets. The differences are divided into ranges or classes. Using the floodplains delineated in the previous steps, we’ll create a flood impact map. This can be used to compare how an area will react to a proposed levee for example. Select Flood | Conversion | Flood → Impact Map menu command. Choose the Original dataset based off your previous delineations. Choose your Modified dataset based off your previous delineations as well. Set the Increase and Decrease sections as desired. Now that the flood impact map is created, you can use the Select Feature Polygon tool to double click on any of the polygons in the map. This will show you the Flood Extent Attributes dialog, which displays info such as the amount of change between the compared datasets as well as the impact class ID and name. 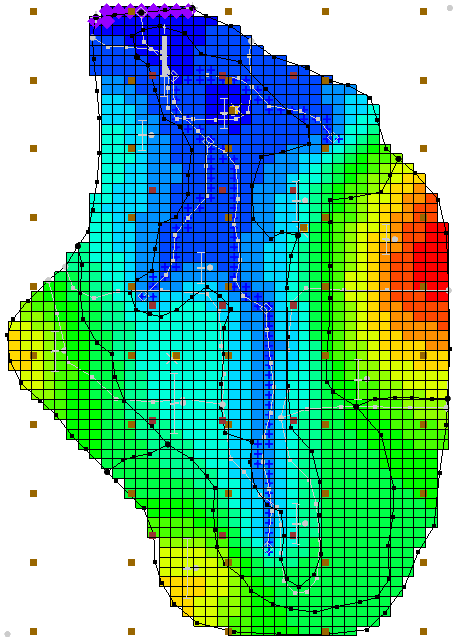 So this a brief overview of floodplain delineation from a scatter point file using WMS. Try it out in WMS today! Have you ever found that the geometry data you’ve imported into your project is in elevation units, but the model you are using requires depth units? Using the the wrong topographic (elevation) or bathymetric (depth) data type can cause significant inaccuracies in your model results. It can also cause a lot of frustration. Therefore, it is always recommended to ensure you are using the correct data before running your model. SMS provides a way to change your data from elevation to depth (or vice versa) after it has been imported into your project. After creating the new elevation set, it needs to be designated as the elevation/depth for the geometry. Now that you know how to change a dataset from elevation to depth, you can avoid the frustration of having the wrong data in your project. Try out the Data Calculator and other tools in SMS today!